DNA is the genetic material in our bodies which make up the cells that determine who we are. A very cool scientist called Elizabeth Blackburn from Hobart found that each strand of DNA has a cap on its ends. These caps are called telomeres They are sort of like aglets (the plastic bits) on the ends of a shoelace. Without the coating, shoelaces become frayed until finally you have to replace them. Of course it’s not so easy to replace DNA strands in our bodies. As the strands become damaged, the cells shorten too and can’t do their job properly. Our cells replenish by copying themselves. This is constantly happening throughout our lives. 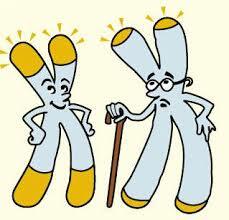 The telomeres replicate and get shorter each time the cell regenerates. Over time the telomeres become too short to do their job causing the cells to age and not function properly. It is said that the shortening of telomeres is directly linked to premature biological aging. They can also be shortened by stress, smoking, obesity, lack of exercise and a poor diet. Elizabeth Blackburn discovered telomerase, which is an enzyme that replenishes the telomere. She believes that mindfulness meditation, changes to diet and lifestyle can have a massive impact on creating the telomerase which regenerate the telomeres, in turn rejuvenating cells. Research has proven too that yoga can play a massive role in reducing stress and increasing mindfulness by activating the parasympathetic nervous system. See my earlier blog http://www.sambandhayoga.com/one-of-yogas-many-gifts/ for more on that. So not only do you get relaxation, strengthening and mindfulness in a yoga practise. You also get anti-aging. Just one more reason to get on your mat!